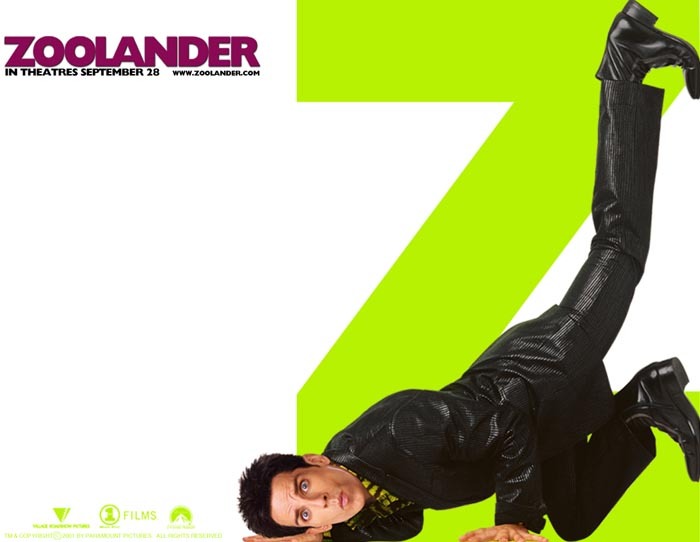 Not too long ago, it was announced that Zoolander 2 would be making its way to cinemas in 2016. I’m of the exact age where I should be excited about that. I was about 20 when the original Zoolander came out and invaded the pop culture nodes of everyone’s brain my age. It was constantly quoted and its catchphrases were quickly adopted by the world at large. Except me. Much like Anchorman, I watched it once, thought it was kind of lame and waited for it to fade away. Only, also much like Anchorman, it never did. People still insist it’s a comedy classic. Since that still seems to be the case after almost 15 years, I figured I owed Zoolander a second chance. Maybe this time, I’ll get it, then I can be excited about Zoolander 2 as well. After winning the prize for Male Model of the Year for the last three in a row, Derek Zoolander (Ben Stiller) is cockily expecting to win his fourth. But cockiness is just the tip of Derek Zoolander’s foible iceberg. He’s also amazingly vain, incredibly un-self aware and monumentally stupid. In the lead up to the awards ceremony, Derek is being followed by Time Magazine reporter Matilda Jeffries (Christine Taylor), who is following the story of Derek, and his latest rival in the modelling game, the free spirited Hansel (Owen Wilson). When Derek loses the Male Model of the Year title to Hansel, it begins a downward spiral into depression and desperation. Which makes it the perfect time for evil fashion designer Mugato (Will Ferrell) to strike. Mugato’s access to cheap child labor to manufacture his clothes in Malaysia is about to dry up as the Malaysian Prime Minister prepares to pass a new law, outlawing the practice. Taking advantage of Derek at his lowest, Mugatu and Derek’s manager (Jerry Stiller as Maury Ballstein) recruit the cerebrally challenged model as an unwitting accomplice in their plan to save child labor. Re-watching Zoolander, my reaction was pretty much the same now as it was back in 2001 or 2002. It’s a perfectly fine, silly, little comedy. It’s not terrible and there are worse easy to fill 90 minutes. But that’s really the extent of it. It’s completely fresh in my mind right now and I still have no idea why it broke through as much as it did back then, or why it’s still so highly revered now. 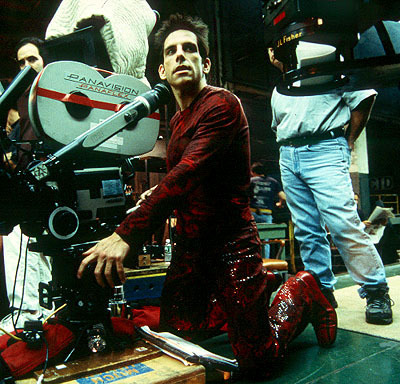 Ben Stiller as Derek Zoolander is funny, at first. But the character is also completely one note. You watch the first 10 or 15 minutes, and you’ve seen every kind of joke that the Zoolander character will deliver. He’s much more suited to a five or seven minute sketch, than he is to being the centre of a feature length movie. At the other and of that spectrum is Will Ferrell’s Mugato. Sure, he’s got a zany wig and wears crazy costumes, but take away those visual affectations, and Ferrell is playing it surprisingly straight. Too straight. I know Ferrell’s over the topness irritates some people, but I generally find it funny. Plus, it just would have fit into this universe a lot better. Even something as hacky as a silly accent would have been appreciated. So, I gave Zoolander another shot and came away feeling exactly the same as I did almost a decade and a half ago. And while I didn’t think it was any worst this time around, its total blandness made me even less interested in a sequel than I was already. Other Opinions Are Available. What did these people have to say about Zoolander? Comedy is such a subjective film genre, it’s so interesting. I, personally, love Zoolander (what is this, a school for ants?!) but I LOVE Ben Stiller. The film I think is ‘meh’ is The Hangover (and sequels) yet I know plenty of people who hold it as their favourite comedy film. I just don’t get it!! I agree with Katied101. I still giggle to myself recalling scenes from Zoolander and found The Hangover completely over rated. I also agree with Dear Reviewer on many of his points. I can think of worse ways to pass 90 minutes – Starskey and Hutch, anyone?